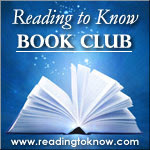 This past month (March) we read The Little White Horse , by Elizabeth Goudge. Stephanie from Simple Things is back again to open up the discussion of this read. If you read along with us this month, please let us know your thoughts in the comment section and also link to any of your own reviews/thoughts on this book. If you've read it in the past and have an old review to post, please feel free. We'd like to know what you thought! Well, what did you think of The Little White Horse ? I am always surprised at what jumps out at me that I didn’t catch on a first (or fifth!) read-through of a book! I still enjoyed this fairy-tale like story, but I was surprised by a few things that I didn’t remember the first time through. The heavy amount of mysticism / magic at the end of the book. When Maria and Monsieur Cocq do Noir were in the forest and the “sea-horses were galloping inland” … what was this? Waves? The sun coming up over the land? A true vision of horses? Way more mystical and confusing than I remembered. I was struck by how many themes of reconciliation there were in the book. Sir Benjamin and Loveday. The Parson and Maria’s governess. And for that matter Robin and Maria after they had been separated as children. Some of these were separated because of time and circumstances while Sir Benjamin and Loveday were split due to childish and petty quarrels. Then there was the sad and tragic separation of the Sir Wrolf and his bride. With the exception of the original Sir Wrolf, I was very pleased that all the other relationships were restored. I do love a happy ending. (My favorite by far – the governess and the parson. Not recognizing each other and then the realizing they had each other’s books! Just the best). As Carrie mentioned in her review, I was puzzled at the end by Robin and Maria’s marriage. I thought maybe I had misread their ages in the story myself because I had definitely imagined them as more childlike and not nearly old enough to get married. I figured I had just missed the line that said “ten years later…” or something of that nature. But no. Married as young teens! However, considering how all the elders in this story waited to get married and ended up being separated from the true loves for various and sundry reasons, maybe they decided that marrying so young was the better plan … before they argued themselves out of that idea? Who knows. Just a few of my random thoughts from this second reread of this book. I enjoyed it though I questioned a few things in a bit more this time as you can see from my notes above. 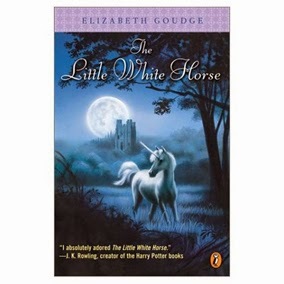 I’m eager to try another of Elizabeth Goudge’s books and see how it compares to The Little White Horse and if all of her novels are along this mystical vein. Thanks, Carrie, for asking me to host again this year! Now it's your turn! What did you think? I just saw that there is a movie adaptation of it!!! Secret of Moonacre?? or something...wonder what that would be like!!! Here's my review from a few years ago. I wonder if it would suffer for me in a re-read? The marriage really didn't bother me at all. People have married in their mid-teens in many cultures and ages in our history. I personally think we postpone marriage a ridiculously long time in our current culture. Fourteen is a bit young, true, but sixteen doesn't seem young to me, and since Robin was also young, I just didn't have a problem with it. The story was so fanciful and so obviously not taking place here and now that it fit. I like that you highlighted the theme of reconciliation and I also enjoyed the story of the parson and the governess. It was so sweet! I should have written my thoughts immediately after finishing the book instead of adding it to a stack of books I need to review on Goodreads. ;) Oops. Anyways... basic thoughts - I enjoyed the writing style, for the most part. I like descriptive writing as long as it doesn't take away from the story. I liked parts of the story itself, especially that last reconciliation between the couple who had exchanged books so many years ago (cute!). But I didn't like how the book slapped you on the head with a moral (they are bad because... they are good because...). Let the reader figure that out for themselves. I didn't like the marriage taking place at such a young age because the characters weren't mature enough. Marry young if you can handle marriage. These two obviously can't if they scream at each other, "you're going to marry me!" And I took issue with some of the religious aspects, especially the statue of Mary that the children gave gifts to. Just a few thoughts. Takeaway - Glad I read it but won't be buying it to read to my children.